Some days, a farmer just feels like she’s under attack. And there’s a good reason for that: she is. Now before you go judging me, let me say that I’m not a paranoiac, constantly looking for the shadowy Other who’s out to destroy my life. But I’m pretty sure that there are dozens of Others who are out there to destroy the garden that I so lovingly (if ignorantly) tend to. I’ve come to learn that there’s always somebody who wants my vegetables every bit as much as I do. Only these little suckers don’t spend hours every day fretting over them, tending them, trans/planting them, and watering them. Nope. They just hop on the fruits of my labor and start munching. First it was the diabolical diabrotica. Emmett’s dad warned us about them: they look like green, slightly oblong ladybugs, and their common name is cucumber beetle. They squish satisfyingly between the fingers, although they anoint the fingertips with rather sticky green guts. (They also possess the remarkable ability to keep walking while trailing aforementioned guts behind them. No, I’m not cruel; the little buggers are just really, really hard to kill.) Anyway, the weird thing about cucumber beetles is that they’ve left our cucumbers untouched. They’ve made lace out of our young snap pole beans, though — leaving a freshly-born bean fighting for its life. We’re so worried about the crop that we actually buckled and bought some organic insecticide: Spinosad. We sprayed it on a couple of days ago, and we’ll let you know if it helps. That was invasion #1. 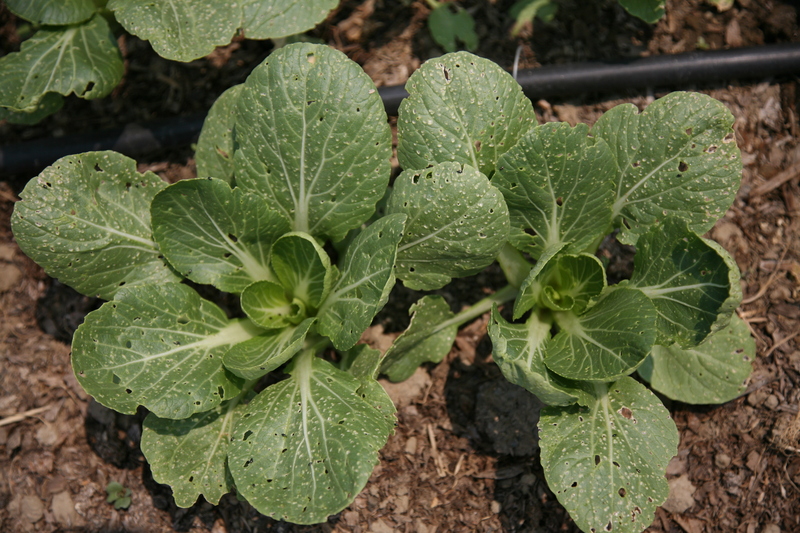 Then there were the flea beetles, which left our bok choi and now our greens pocked with tiny holes. And on the very same day that we diagnosed the flea beetles as such, we found a mystery depression in the salad bed, a 1.5-inch deep circle that had upended a bunch of our baby lettuce greens. (Emmett thought it might be a deer, but a deer would have probably eaten the salad. My suggestion: Bigfoot.) Oh, and did I mention the gophers that tunneled under two of our squash mounds? While I’m a solid, committed proponent of organic agriculture — with insectories and pest management strategies that don’t involve chemicals or traps — I can also completely understand the impulse to basically bomb the heck out of the field. You’re under attack: you need to fight back. Your hard work, your way of life, your very survival is threatened. But there’s a smart way to fight back, and a less smart way. (It parallels, in many ways, the differences between conservative and liberal mindsets when it comes to national security and war.) Do you ‘drop the big one now,’ or do you use carefully-calculated strategies that minimize collateral damage and maximize public health? Well, better wrap this post up. I’ve got to get back to squishing Diabrotica.